The Building Efficiency team is a group of dedicated home performance professionals based in San Francisco. Since operations began in 2009 we have performed hundreds of Home Energy Upgrades and saved home owners thousands on their home energy costs. 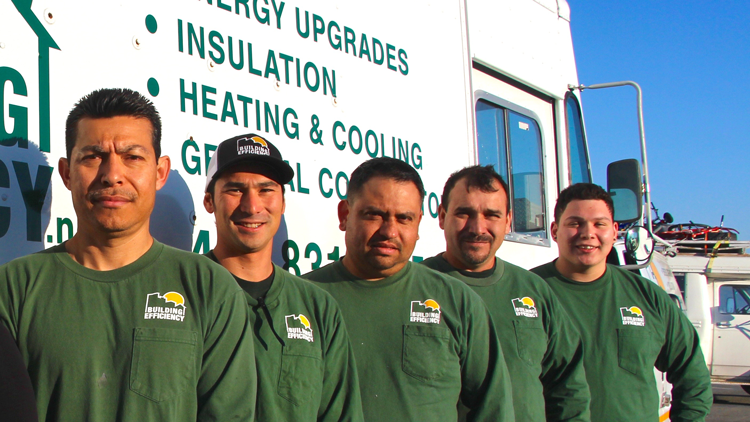 At Building Efficiency, we perform your HVAC and Insulation upgrades in-house, with our dedicated field team composed of Jose, Lalo, Beto and Omero. All of our field employees have been with the company for multiple years and are both personable and professional. Customer service is a top priority for Building Efficiency and our Office Manager, Heather, helps you prepare for your project and processes your rebates so your home energy upgrade goes off without a hitch. Personally and professionally committed to Green values, David Hamburger has earned a range of building efficiency credentials, including CBPCA Verified: Home Performance Contractor, BPI Certified: Building Analyst, and HERS Rater: HERS 2. He has building experience in both conventional and alternative construction—including passive homes in California and British Columbia using a variety of materials such as cob, rammed earth, and straw bale. He holds a B.S. in Ecology and Evolutionary Biology from University of California, Santa Cruz. Building Efficiency was conceived in response to the growing environmental, economic, and health challenges we face today. We believe that “Building Efficiency” is the first step in sustainable action. We aim to reduce your energy costs and build a green footprint in your community.